Good morning! Was this email forwarded to you? Sign up here. My latest column tackles the lost art of bipartisanship. I'll share a glimpse of that, and then Ben Geman will get you up to speed on the rest. Democrats who want to tackle climate change are about to face the biggest challenge with sweeping policies — they're much more likely to pass if they get support from both sides of the political aisle. Why it matters: No matter how far-fetched it seems after the government shutdown, the fact remains that policy endures better with bipartisan support, political scientists and past precedent suggest. This is particularly relevant in trying to solve a problem as enormous as climate change and with progressive Democrats rallying around a Green New Deal (GND) that calls for massive economic transformation. Driving the news: After an absence of nearly a decade, two big climate and energy policies are emerging in the Washington debate. The GND represents the progressive flank of the Democratic Party, but it has no Republican support. The other, a carbon tax, is bipartisan and reflects controversial compromise. By the numbers: While America’s political discourse has gotten more partisan in recent years, actual laws passed by Congress have not, according to forthcoming research described to Axios by James Curry, political scientist at University of Utah, and Frances Lee, politics professor at the University of Maryland. Since 1985, majority parties controlling Congress have passed just 12 laws getting largely what they wanted on big policy priorities over the opposition of most members of the minority party and the minority party's top leaders. That’s less than 5% of all the majority-party policy priorities considered in more than 30 years. Of the 12 that have passed by rolling the minority party, 2 have been high profile and more recent, making it perhaps seem more common when it actually isn’t. These include the Affordable Care Act of 2010, which Democrats pushed through with no GOP support, and the 2017 tax overhaul law, which got no Democratic votes. Republicans, meanwhile, have been chipping away at the health care law since it passed, eroding its effectiveness. Examples of bipartisan bills include 2 comprehensive energy bills in 2005 and 2007 and a 2015 spending bill that featured policies with big repercussions for energy and climate: lifting the 40-year-old ban on oil exports and extending wind and solar tax credits. Go deeper: Dive into the rest here. China's largest ride-hailing startup Didi Chuxing announced Monday that it will form a joint venture with automotive giant BAIC to deepen its focus on electric vehicles, TechCrunch and others report. Why it matters: China is the world's largest auto market and already has the largest number of EVs, too. The big picture: Monday's announcement is another sign of 2 big and converging trends in transportation — the rise of shared-mobility and EVs. 'Jingju’ — as the venture is called — is a partnership between Didi and BAIC affiliate Beijing Electric Vehicle that will develop "next-generation connected-car systems" using fleet management, AI and other tech, according to an announcement made today. The official figures for Venezuelan oil production show it falling almost by half since 2013, Axios' Felix Salmon points out in his newsletter Axios Edge (subscribe here). But, unofficially, Venezuela observers think even these numbers are exaggerated and that the country is producing barely more than 1 million barrels of oil per day. Sources say it will take many years to fix PDVSA, Venezuela's state-owned oil company, and start turning these numbers around. [T]he damage inflicted on the country’s oil sector by years of under-investment and mismanagement, compounded by the exodus of large parts of the skilled workforce, will not be quickly, or easily, reversed. And it won’t matter who is in power, or how any transition comes about. State of the market: "Oil prices fell on Monday, in tandem with global equities, amid doubts over any near-term solution to the trade dispute between the U.S. and China, and fears that border-security negotiations in Washington could fail to prevent another government shutdown," the Wall Street Journal writes. United Arab Emirates: Via the Financial Times, "Abu Dhabi National Oil Company has awarded equity stakes in its refining subsidiary to European oil majors Eni and OMV as the Gulf emirate continues to open up its hydrocarbons sector with one of the world’s largest refinery transactions." Saudi Arabia: Per Reuters, "State-owned Saudi Aramco plans to invest up to $1.6 billion for a nearly 20 percent stake in South Korean refiner Hyundai Oilbank, expanding its foothold in one of its biggest Asian buyers of crude oil." Hong Kong: Bloomberg reports, "Hong Kong’s billionaire Cheng family, which controls a real estate and jewelry empire, is exploring a bid for European fuel supplier Varo Energy BV, people with knowledge of the matter said." 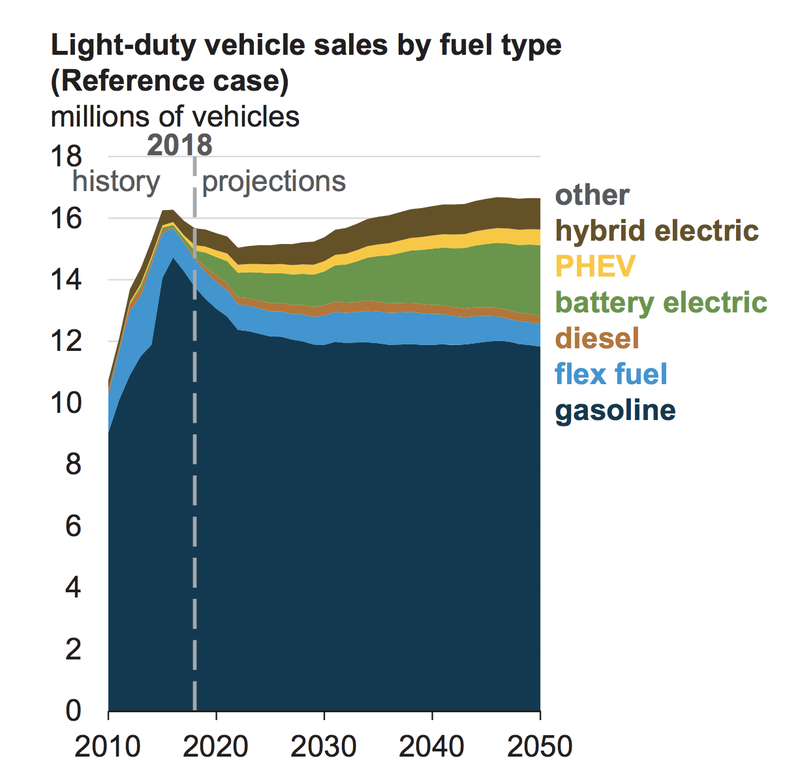 Screenshot of chart on projected vehicle sales from EIA's Annual Energy Outlook 2019. PHEV is a plug-in hybrid electric vehicle. The Energy Information Administration's latest set of long-term projections is kind of a sad trombone when it comes to the growth of EVs in the U.S.
Where it stands: The "reference case" in EIA's Annual Energy Outlook 2019, captured in the chart above, projects that EVs will grow but internal combustion engines will remain "dominant" through at least mid-century. They see gasoline-powered and to a much lesser extent "flex fuel" (gasoline-high ethanol) vehicles accounting for 75% of the light-duty sales in 2050. The other side: Contrast their outlook with the consultancy BloombergNEF. They see battery electric vehicles (BEVs) and plug-in hybrids swelling to 64% of the U.S. market in 2040, with BEVs sales around 10.3 million, which is several times what EIA projects, their analysts told me. Yes, BNEF has long been the optimistic end of the spectrum, but a number of major forecasters have been boosting their estimates too. Where it stands: EIA has long faced criticism for low-balling the growth of renewables, and there's reason to think they're too conservative when it comes to EVs too. Consider Rice University analyst Daniel Cohan, who questions their cost comparisons for gasoline-powered versus electric-powered vehicles. But, but, but: To be fair, it's an exercise and EIA takes some pains to show that there are all kinds of variables and the future, like, hasn't even happened yet. The reference case, for instance, assumes that laws and policies remain unchanged, and needless to say U.S. policy isn't static. Read more: Harvard energy expert Jesse Jenkins discussed the topic via this Twitter thread over the weekend. It's a helpful look at the uses and limitations of long-term models, and his view that EIA's methods don't adequately consider technology and economic changes. A pair of new pieces highlight the challenge of ethically sourcing cobalt from the Democratic Republic of the Congo. Why it matters: Cobalt is a key material for batteries for EVs and other uses, and the DRC provides over half the world's supply. What they're saying: Writing in Foreign Policy, Antony Loewenstein takes a skeptical view of Blackwater founder Erik Prince's new project to invest in development of natural resources for EV batteries in the Congo and elsewhere. The piece notes that the Prince wants to create more ethical mining for the material, which is now reportedly often mined under hazardous conditions and with child labor. But, but, but: "Prince’s record in conflict zones provides little reason to believe he has either the inclination or ability to mitigate violence in Congo or Afghanistan," Loewenstein writes. A separate weekend piece in the New York Times looks in detail at cobalt and copper mining in the DRC in the context of the region's tragic conflicts and corruption. "The mineral riches that should make the country wealthy have funded governments whose corruption has undermined the young democracy and left its people desperately poor," writes Michael J. Kavanagh. "The copper and cobalt boom has brought Congo steady economic growth, yet its per capita income remains among the lowest in the world."